Go back to Hyrule Castle from the garden like the previous time and get in the Sanctuary. 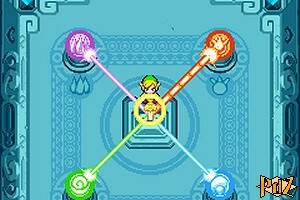 Thrust your sword into the pedestal to infuse the fourth element into the sword and you're now able to create three clones! Your sword is now the Four Sword! Follow the new corridor and take a look at the stained glass windows. 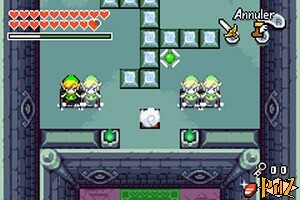 After this cutscene, go back south, create three clones on the slabs, step on the switches and get out. Perform a Spin Attack in front of the minister and the guards to bring them back to life and get out. Go west, climb the stairs and go north twice. Go through the flame barriers, then go north. Blow up the wall on the right, shrink on the pedestal, then go back left, down and jump into the hole. Go north, get in the passage, then turn back to your usual size. Step on the switch and get in the next cell. Bring the king back to life and talk to him to get a Small Key. Get out and get back to the first underground level. Go south, create three clones on the slabs, push the block and go on south. Open the southern door, follow a corridor and go down the stairs to the right. Open the chest to find the Map. Go back to the left and climb the stairs. Go down the stairs and go south to leave the castle. Now you can use this free time to hunt Pieces of Heart, get a bigger Bomb Bab and a bigger Quiver, buy the Boomerang at Stockwell's Shop or sharpen your sword master skills. You can also refill your hearts and go to Syrup's for a red potion. When you think you're ready, go back in the dark castle. From the main entrance, go straight ahead, then go west where the small black balls are expelled. 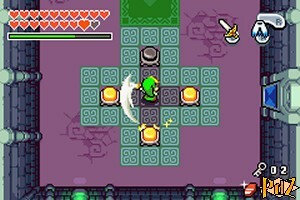 Load your sword between two slabs, then create three clones on the slabs and hit those balls. Go on to the north. Go right, walk on the slabs so you walk on each of them, then get out from the right and go south. Create three clones on the slabs, then go down while avoiding the blocks and the trap. Take the Small Key from the chest, then go back south until the green carpets crossroad and climb the stairs to the right. Open the door that will bring you back to the first underground level. Go north, get rid of the four Stalfos, then create three clones on these slabs: first column - first row, fourth column - second row, first column - third row and fourth column- fourth row, load your sword to prepare a Spin Attack, then get in front of each statue and release your power. Go on north, get rid of the enemies then drop a bomb next to the left wall, rather to the south. Go ahead, go north and climb the stairs. Beat the Darknut, then go right. Pick up the Compass from the chest, then go back left and push the armchair! Go down the stairs, light the lantern, then go east and north. Climb the stairs, go right and climb the stairs to the second floor. Hit the enemy with the Boomerang if you need to refill your hearts, then go south to go outside. Jump into the tornado and get through the next ones towards south, then go back into the dungeon. Create three clones on the slabs, then push the big block to the south and get out from the right. Jump into the tornado and get through the following ones to go south. Go on to the west, shoot an arrow at the button, cross the bridge and get into the dungeon. Create once more clones so you can hit all four buttons at the same time and go up. Get rid of the two enemies like you did previously to create a first warp tile. Go left, then up, toss a bomb at the cracked blocks, then climb on the platform. Use the Cape to jump on the grate, shoot arrows or use the Boomerang to activate the buttons, then get out from the north. Go right and up. Fight the first Darknut of many to come to create a second warp tile. Go back down and left. Get rid of a second Darknut, then go north. 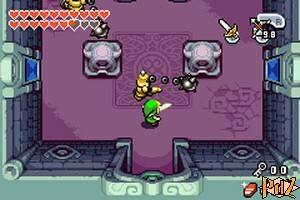 Get rid of the Stalfos and the Wallmasters, then shoot an arrow at each eye so all the eyes are closed at the same time. Go on to the left, push the blocks, jump into the hole, climb the stairs again, then step on the switch. 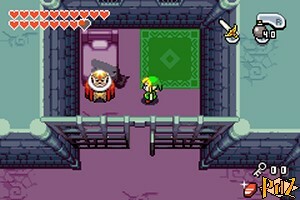 Go down to get back two hearts, then come back, climb the stairs and take the Small Key from the chest. Go back down, push the blocks, then come back right and down. Come back down twice and this time you will have to beat two Darknuts! Go on down, break some pots to get some hearts, stand on all the slabs to open the door and go down. Get rid of the Poes, get out, outside go west and enter the tower. Go down the stairs to refill your bombs and arrows, then go back up, climb the next stairs and find a second Small Key in the chest. Come back down, get out, go back in the castle and go north twice. Go right twice, fight off a third Darknut, then go down. Get through the flames, then stand precisely in the middle of the switches, and perform a Spin Attack to hit all of them. Go right, step on the switch, then climb the stairs. Pick up the third Small Key in the chest, then go back down and go back left, then up. Go back left twice, up twice and right twice to encounter more Darknuts. Once they're defeated, go up, quickly light all the torches and go on up. Get rid of all the Ghinis, then go right, climb the stairs and pick up the fourth Small Key! Go down the stairs and go back left, down twice and left. Go on up twice, then unlock all four blocks. 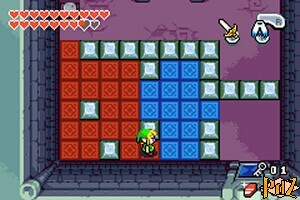 Refill your hearts thanks to the pots, then create three clones on the slabs to push the big block to the left. Open the chest and pick up the Big Key! Go back down twice, left, down twice and right, then open the boss door. Go ahead through the corridor while avoiding the enemy thanks to the Roc's Cape, then get rid of the Keatons, create three clones on the slabs and step on the switches. Now you will have to defeat three Darknuts and what's more is that you have to do it fast, because upon the third bell ring, it's over. You can also use the Roc's Cape to get over them and/or use bombs to stun them for a few seconds. Once this trial is cleared, go up to meet Vaati and Zelda.